I’m addict to adding oats in my smoothies for breakfast. 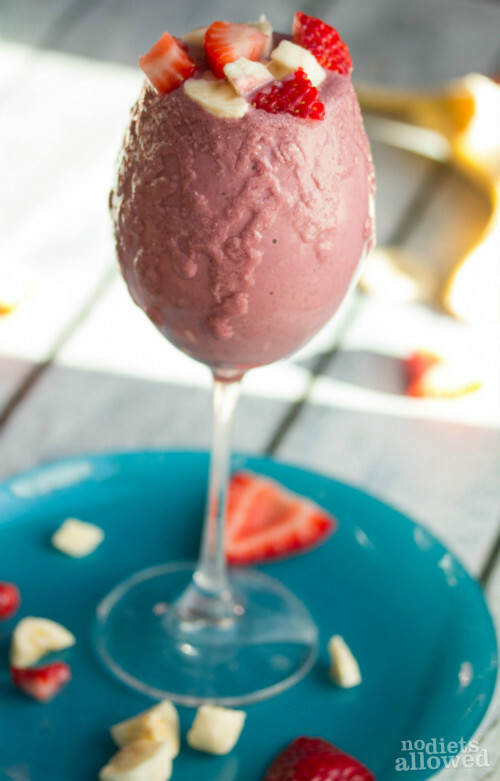 I make this creamy and refreshing smoothie almost as frequently as my Banana Apple Oatmeal Smoothie. Oats are high in fiber and protein while adding a mild flavor and creamy texture. Why not add more protein and fiber where you can? Especially to give you a boost in the mornings. 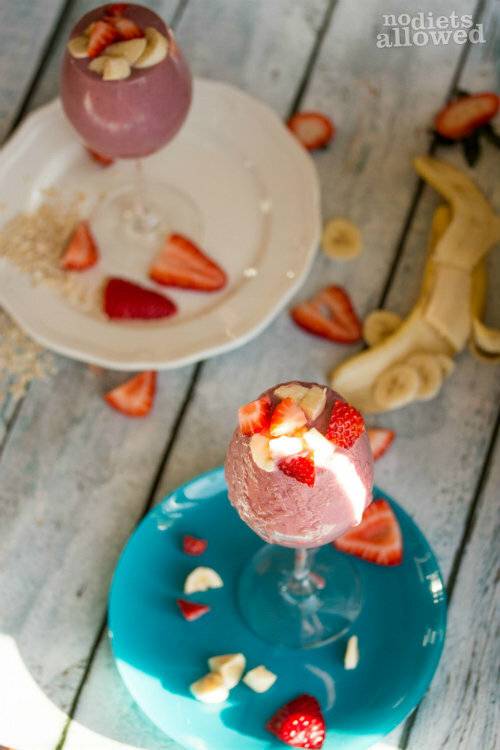 You can make this smoothie in less than 5 minutes (I timed it). I want to make healthy tasty and quick for you! I also added Chia seeds and an organic carrot. 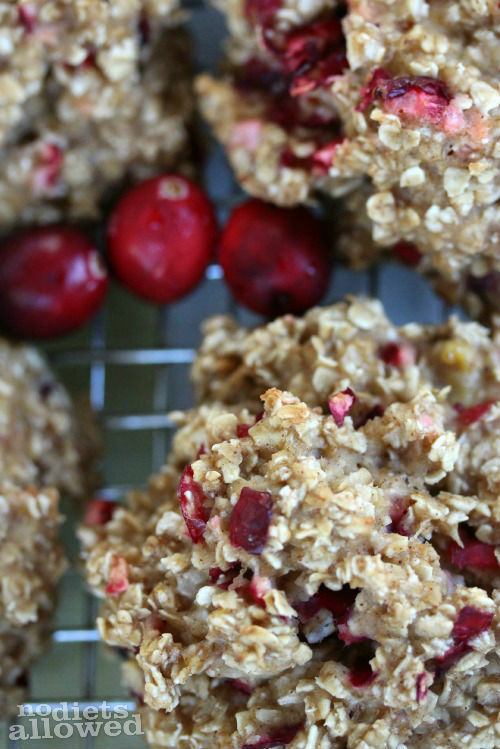 Just like the oats, they are mild in flavor but add rockin’ nutritional value. Please purchase organic carrots. One day I was eating a raw carrot (not organic), and I noticed my tongue start to tingle. Not only that, but I had a weird aftertaste which resembled something like soap not a carrot. Carrots have a thin skin which allows them to absorb pesticides, chemicals, and other nasty stuff. They’re actually pretty cheap too! You and your kids will love LoVe LOVE this new breakfast option! Add ingredients in order listed into Vitamix blender. Blend on high for about 30 to 45 seconds until smooth. If you would like it thicker, add more frozen strawberries or ice 1/2 cup at a time. 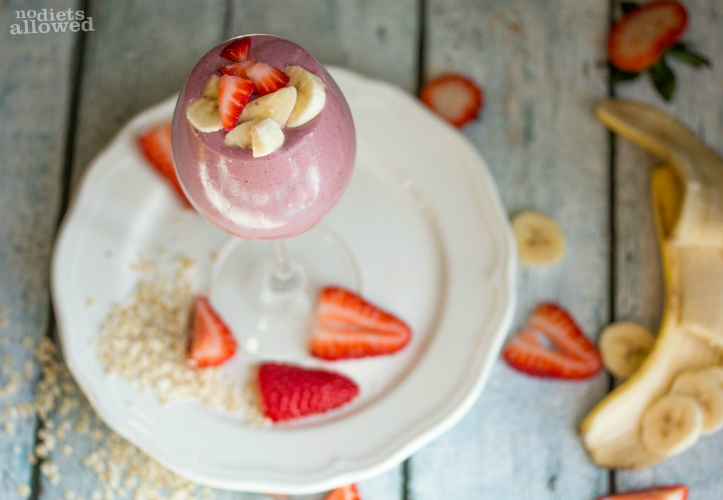 This smoothie and a couple Healthy Oatmeal Breakfast Cookies go hand-in-hand. It’s like you were reading my mind! I just decided it would be great to have some smoothies for breakfast. Pinning! Thanks, Jesseca! I really like this one too. Deliciously simple! Yes. Yes. and Yes. This is so simple and so perfect. Pinning for sure. Thank you! Yvonne, I always love your comments! Thanks for pinning! Yumm! 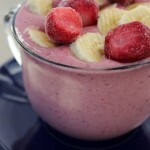 I’m always looking for new smoothies recipes :)! I can wait to try this one! Karina, I hope you enjoy trying it out! Let me know what you think. Oh this looks so good! I have never thought of adding oats to a smoothie. Summer, oats make it really creamy. I love adding oats to my smoothies especially in the morning. Random question: Why quick oats? They are more processed than regular/rolled oats and have less nutrition content. Can you use regular/rolled oats instead? Kareena, you definitely can try regular rolled oats. I don’t think the texture comes out as smooth and creamy, but you definitely can substitute with rolled oats.